Ko Kret is a lovely island located next to the Chao Phraya River. The island is well-known as a centre of earthenware production of Mons' people and authentic old-style pottery in history of Thai people. Why Ko Kret Island is special ? Cut off from the rest of Nonthaburi province by the Chao Phraya river some 20 kilometres north of central Bangkok, the island of Ko Kret is home to centuries-old temples, a great weekend market and a Mon community known for its handmade earthen clay wares. This may not be your typical Thai island getaway, but Ko Kret’s countryside setting makes it a great urban escape. The story of how Mon people came to settle on Ko Kret is a sad one. Long after the Mon civilisation of Dvaravati had been incorporated into the Lanna kingdom of what’s now northern Thailand in the 13th century, the Mon stronghold of Hongsavatoi — in what’s now lower Burma — was sacked by a Burman army in 1757. In the brutal genocide that ensued, the invaders killed tens of thousands of Mon people. Many of those who escaped fled west over the mountains, eventually settling along the Chao Phraya river in Siam, the predecessor to modern Thailand. After such a horrific attack, it’s no surprise that the Mon sought isolated areas like Ko Kret, a flat stretch of land that had been transformed into an island when a canal was dug in 1722 to shorten the route to Ayutthaya. The Siamese looked favourably on the Mon due to a shared contempt for (and fear of) Burma, but also due to the Mon people’s gentle disposition and earnest dedication to Buddhism. In the early 1800s, the Thai monk/prince who later became King Rama IV was so impressed by the disciplined Mon Buddhist tradition that he used it as a model for the reformed Thammayut order, which remains one of Thailand’s two major Buddhist branches. What to explore at Ko Kret Island? Ko Kret’s largest temple, Wat Poramaiyikawas, remains a pilgrimage site for people of Mon descent from throughout Thailand. Resident monks continue to perform chants in the Mon language and many scriptures are written in Mon. The temple also features Ko Kret’s signature lopsided Mon-style chedi, a 10 metre-long reclining Buddha and a seated Buddha considered Nonthaburi‘s most sacred. On the other side of the island, Wat Sao Thung Thong‘s late Ayutthaya-style chedi shows how the Mon adopted elements of their new home while mindfully preserving their own culture. Many descendents of the Mon who arrived in the 18th century have since been assimilated into Thai society, but Ko Kret’s community retains much of its traditional Mon character. Even if Thai is now widely used, the Mon language is still spoken here. 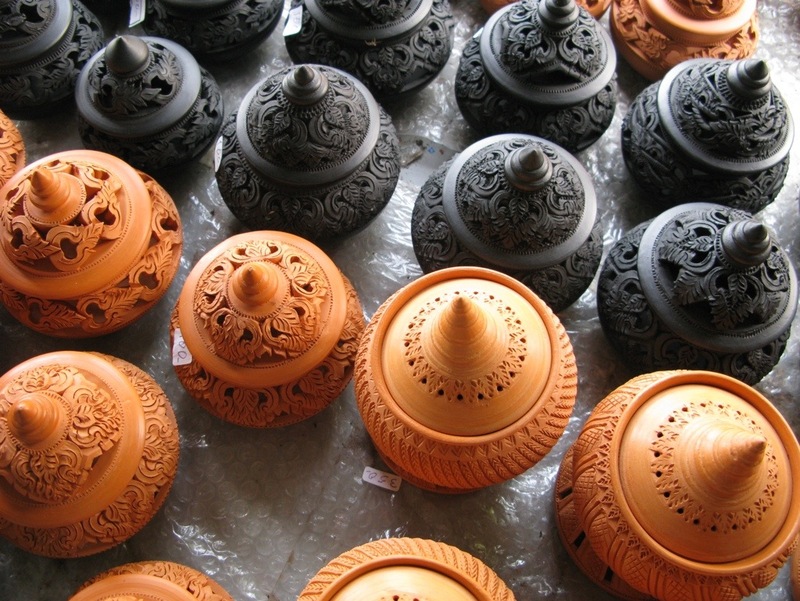 Mon artistry lives on in the earthen clay bowls displayed at stores and museums, and crafted at workshops throughout the island. It’s still common to see clay pots filled with water outside homes and temples, an ancient Mon custom that offers passersby a quick wash or drink. Weekending urban Thais flock to Ko Kret’s riverside weekend market to sample the sweets, edible fried flowers, fish cakes, curries and fragrant chilled rice (khao shae) that the Mon are famous for. Though ‘I love Ko Kret’ T-shirts, key chains and cutesy souvenirs are available, the narrow market lanes remain more charming than touristy. After picking up a few ceramic bowls and sampling the outstanding Mon food, we rented a push bike to explore the island’s outer reaches. In Ko Kret’s southern village, we meandered passed weathered wooden houses, potted plants, napping dogs and residents who flashed us smiles from their porches. Some houses double as modest cafes and restaurants that cater to the weekend visitors, while others serve as convenience shops for the locals. The outer walls of many are adorned with colourful paint jobs and makeshift works of art. Ko Kret remains a largely self-sufficient community; family businesses contribute everything from motorbike repairs to herbal remedies. Numerous side paths shoot to quiet riverside perches where we found locals feeding the fish that teem in the Chao Phraya. From the opposite bank, Buddha images gazed back at them. The track around Ko Kret is only five kilometres long, and you can easily see most of the island in an afternoon by push bike, or a day if you prefer to walk. Rented bicycles are readily available in the village for 40 baht, near where the ferry arrives at Wat Poramaiyikawas, and maps are provided. You can also flag down a longtail boat from anywhere along the river. These will cruise you around the island and stop at some of the outlying temples, or perhaps Khlong Khong Wan, a canal lined by sweets shops. Cross-river ferries run throughout the day to Ko Kret’s Wat Poramaiyikawas pier from Wat Sanam Nuea, a 10-minute walk or 20 baht motorbike taxi ride from the main Pak Kret pier. The five-minute trip across the river costs two baht. You can also arrange for a boat to take you directly to Ko Kret from the main Pak Kret pier. How to get to Ko Kret Island? Cross-river ferries run throughout the day to Ko Kret's Wat Poramaiyikawas pier from Wat Sanam Nuea, a 10-minute walk or 20 baht motorbike taxi ride from the main Pak Kret pier. The five-minute trip across the river costs two baht. You can also arrange for a boat to take you directly to Ko Kret from the main Pak Kret pier or all the way from one of the Bangkok piers. One way to reach Ko Kret directly is by taking a tour on one of the Chao Phraya Express Boats, departing every Sunday and costing 300 baht per person. The ride also includes various stops at temples and points of interest along the way to Ko Kret. At any time, you can take an orange or green flag Chao Phraya express boat direct to Nonthaburi pier (the last stop), then catch a taxi to the pier in Pak Kret for around 100 baht. Taxis are readily available for the return trip. Another way to reach Pak Kret is by bus #166 from Victory Monument. If you don't want to travel by yourself, then there is a tour every sunday operated by Chao Phraya Express Boat for 300 Baht. lots of vendors and friendly people. The food was tasty too. It is a good place to bring some cash to purchase unique gifts.. If you're on a budget, are a bit tired of the traffic, and pollution in Bangkok, and fancy a cheap escape to some greenery and quiet, then this is a nice excursion.We went on a Sunday afternoon around 3pm, when the light starts getting lower, the shadows longer, and the sun starts cooling. The cycle routes are mostly in the sun, so you will get hot - I would recommend an early morning, or late afternoon visit. Take a hat and suncream.Drove almost to the ferry crossing, there is parking at the temple, but this looked full when we went, so we drove a little further down, and paid 40B for a private car park instead.Ferry's continuously go back, and forth, so no waiting, paid when we got onto the island - 2B!Hired a bike each - 40B, no helmet, and iffy breaks, steering etc, but you'll get used to it. We hired the bike as soon as we got off the ferry, and the lady we hired from spoke enough English to communicate with, and help us get food first (30B for noodles with beef).Then we did a clockwise loop of the island - took about 1 1/2 hours, with some stops for ice cream (15B for 2 from a man with an ice cream trolley), pictures, watched a bit of a local football match (in Liverpool vs Chelsea kit), and just meandered.Paths are all concrete, and raised. They are wide enough not to fall off. Although to be safe, we did stop when someone came the other way. Near the ferry terminal is the market/ built up area which you have to cycle through on the way back, here the paths are narrow, and you really have to walk the bike through when there are other shoppers. I'd recommend taking the bike back, then going on foot back to the market. Its time for you to check out Ko kret island bangkok on the chao phraya river. Ko kret island is roughly 40 mins away from bangkok (traffic pending) There are a few options for getting there. You can go to victory monument BTS stop get out and jump on a 166 bus which takes you to the Ko kret area. You can ask the ticket seller or driver when to get off. Other option is to take the boat on the Chao Phraya river to the last stop at nonthaburi. Get off and then take a bus number 51 104 or 32. You take a very short boat ride accross to the island which costs about 5 baht. When you exit the boat you are on Koh kret island, push bikes can be hired which is the best idea as you would never be able to walk the whole distance. Ko kret has many interesting little areas for buying gifts and eating. It is mazed with little paths which are very busy with both motor bikes and people walking. You can sit riverside and have some great thai food from one of the many small eating houses. As you eat you can look out over the river accross to a big white budhaa. Koh Kred island was created in the 17th century by the mon tribes people who originated in the north of thailand but where enslaved by their southern richer more powerful neighbours. The chao phraya river had a huge bend in it and this slowed down transportation so it was decided that a track be cut through to make the journey shorter. The mon tribes eventually came to inhabit this peice of land which became an island, The mon people make pottery on the island and you can visit this wonderful place and see them at their work. (its always good to buy something as this is helpful for their survival). Their is a colourful temple at the beginning of your walk/cycle so give it a visit. For me this is a good day out and if you are on a budget visiting koh kred is very very cheap. you could travel and visit it for less than 50 baht. (not including eating) Its very good day out as you get the river part of the trip aswell and the bus journey, walking, or cycling and learning about more thai culture. I would rate Koh kret 8 out of 10. Of course if you want to visit Ko kret big style with more frills then you can do the touristy thing and go by boat from bangkok but this will cost much more. You can find out about excursions to koh kred from the main river pier saphin taksin at sathon pier 1 (central pier) Ok trip advisor people its bye for now and talk to you soon. If you have any questions please feel free to contact me.